If you follow the world of video games, then you know that now E3 expo, on which the developers and the publishers of the different projects are telling lots of interesting information about them, is taking place. A couple of hours ago, we told you about the announcement of GTA V on PC, PS4 and Xbox One, and now are hasten to share the fresh information about another popular project. So, are you ready to get to know some fresh Far Cry 4 news? Then go ahead. First of all, we are happy to show you two new Far Cry 4 gameplay videos, which were published yesterday. The first trailer is rather long, and it demonstrates us five minutes of this action-adventure. 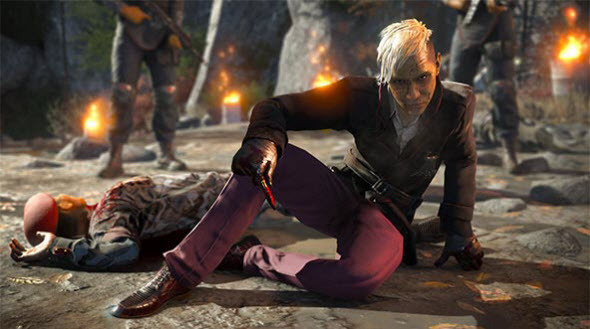 Here you will see the protagonist, get to know the way he has found himself in Kyrat and even can appreciate some actions of a bit crazy this country’s king - Pagan Min. The second video shows us how the protagonist goes around the incredibly dangerous rocks and flanks of the snowy Himalayas. So, if you want to know how the main game’s character looks like, which facilities he can use in order to travel in Kyrat’s rock plains, then watch fresh Far Cry 4 gameplay videos, published below. But that’s not all Far Cry 4 news. Another nice surprise concerns the game’s co-op mode, entitled “Guns for Hire”, which will allow two players to unite and explore the huge open world of Far Cry 4 together. Thanks to this mode, you will be able to get in-game cash, to fight against different enemies and get the most interesting experience. Besides it, the owners of PS3 and PS4 game’s versions will get a set of “Keys to Kyrat”, which will allow them to invite lots of friends into your open project’s world and enjoy the game together. Did you like new Far Cry 4 gameplay videos? What do you think about the fresh news? We are always interested in you opinion, so don’t be shy and write us in the comments below.